Britain's involvement in the Great war was a national tragedy , as it was for all the countries involved.The losses affected almost every family in the country, because it demanded mass conscription for the first time in the nation's history. 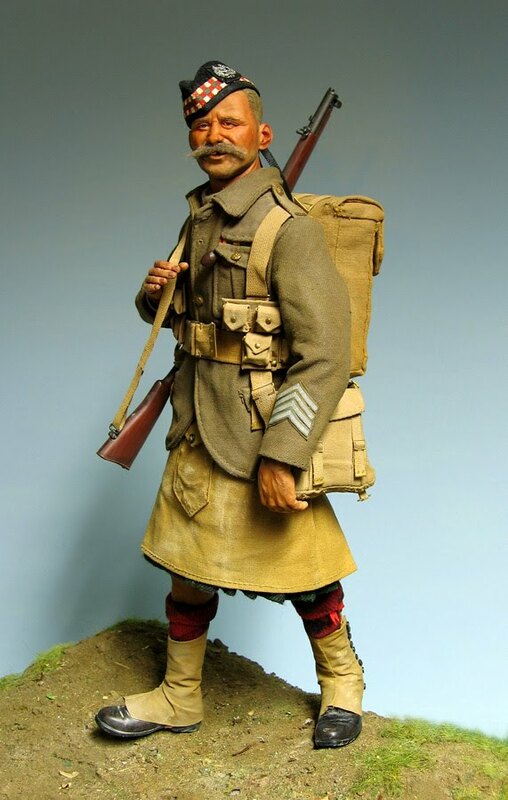 At the beginning of the War, however, the small British Army sent to Belgium was entirely made up of long-service Regulars: Old Sweats, of whom this figure from the Gordon Highlanders was one. They proved the worth of their training and experience by the fact that they succesfully stopped the German advance, against huge odds, whenever they were given the chance to stand and fight. They paid a terrible price: by the end of the year, by which time the trench lines were stabilising, there were very few of them left. Based on the Sideshow figure , with massive improvements. The village where I live, just on the edge of York , has a War Memorial , like almost every other village in Britain. Investigating the names on it has been interesting : most of the men joined the Prince of Wales' Own West Yorkshire regiment, particularly the 5th Battalion, who were Territorials. Amongst them was one A.Holt aged 18. I imagined him as an underage soldier : there were an awful lot of those, only -too-desperate boys wanting to join up, and lying about their age to do so. The army connived in the fraud, willingly taking anyone big enough....and quite a few who were not. 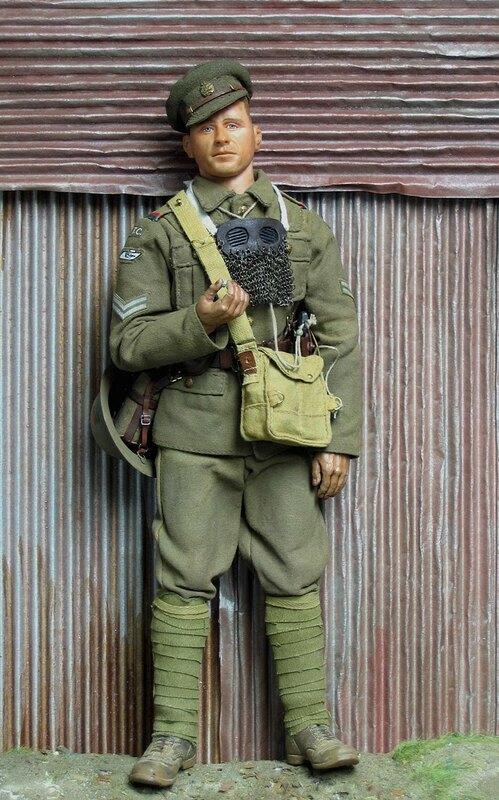 The Territorials, having a pre-war existence as a sort of military men's club, had a sort of family air about them, which they took with them to the trenches, and despite awful losses on occasion , proved themselves every bit as good as the regulars. 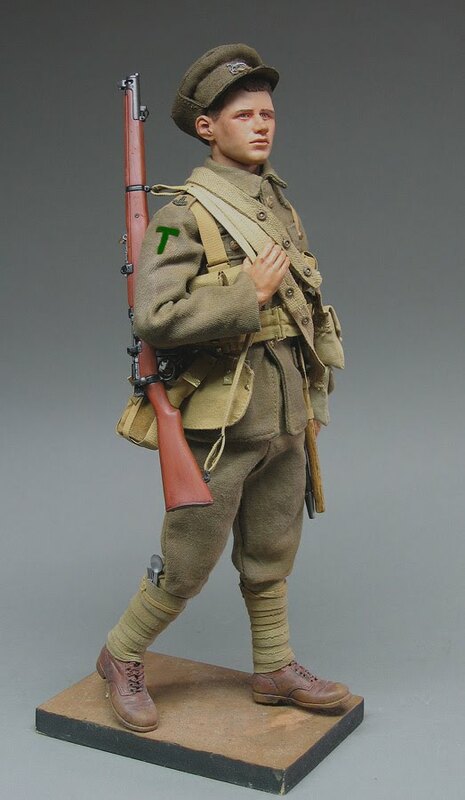 The green T on his sleeve was used by this battalion... perhaps later. 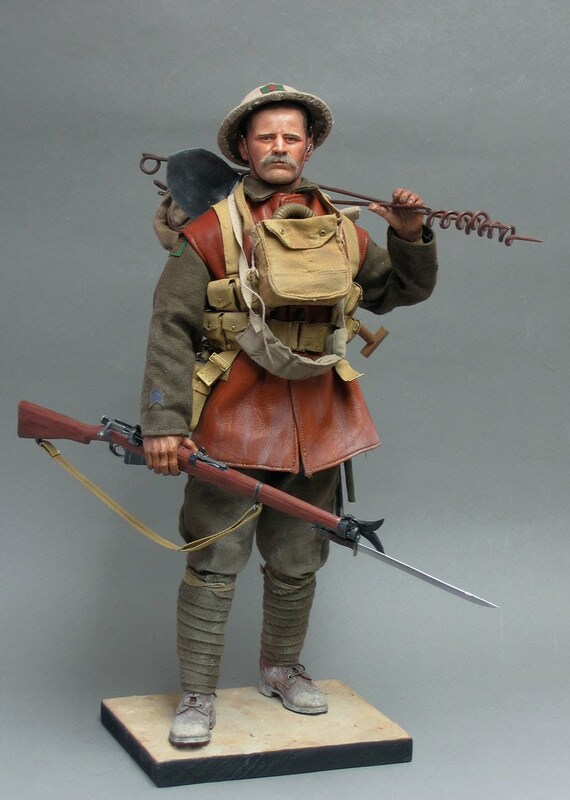 Technically , at this date he is more likely to have been carrying the Long Enfield, which was still in use in Territorial battalions.. but I haven't made one yet. The Battle of the Somme is seared into British popular consciouness as the worst and most pointless event of the Great War. It has become the epitome of the futility of war : thousands of our lads cheerfully going like lambs to the slaughter. Like most pieces of popular mythology , it's true at an emotional level , but not at a factual one. It has become so much part of everyday knowledge that very few ever question it. Whilst undoubtedly ghastly , it had to be fought. Britain was in a coalition with the French , who were suffering their own martydom at Verdun. They had to be supported , and to launch the Somme offensive in the summer of 1916 seemed the only viable option. The fact that the troops , the Kitchener volunteers , were so undertrained that they had to adopt stupid tactical procedures is largely the cause of the terrible carnage. Nonetheless the Germans suffered roughly equal casualties , and they had fewer to lose. Since no-one anywhere seemed to have the slightest notion how to avoid a war of attrition, it was horribly inevitable, unless the Entente wished to lose the War. The arrival of the first tanks certainly made a difference, if not actually winning the War. They were , however, very ill designed and unreliable machines, and because of their shortcomings demanded a rather special breed of men to crew them. Ideally , they should be below 5'4", impervious to120F heat , carbon monoxide and cordite fumes , immune to motion sickness , and preferably with armoured skin as well. Such paragons were rare, so they recruited ordinary men instead. to get out, they were at least as vulnerable as any infantryman. 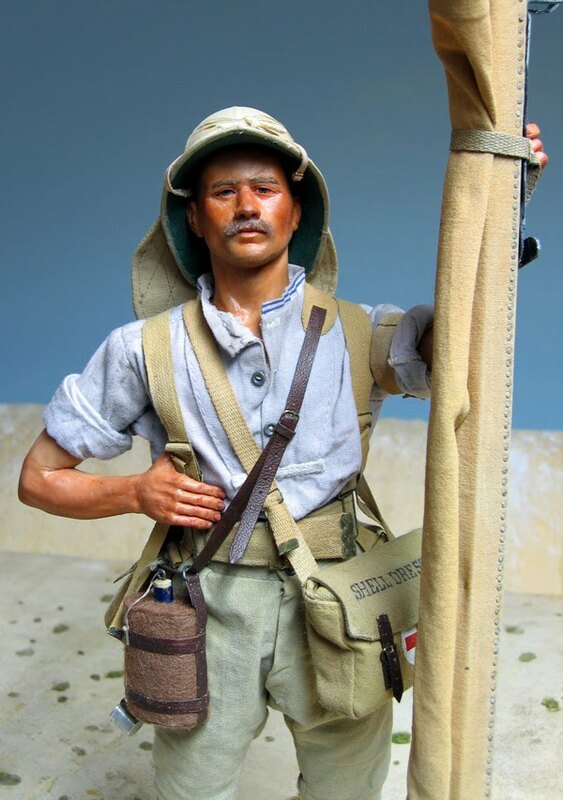 He has the leather belt and pistol set , and the red-green flashes of the 7th Battalion. British soldiers in Iraq are nothing new : in 1915, an invasion came to grief at Kut , where General Townsend's ill advised advance ended in a siege and surrender to the Turks. The more capable General Maude took over , and at the end of 1916 launched a better supported campaign which succeeded in capturing the bulk of the country. Fighting in this climate in the summer was a severe trial , possible made worse by the Edwardian notions of suitable clothing. 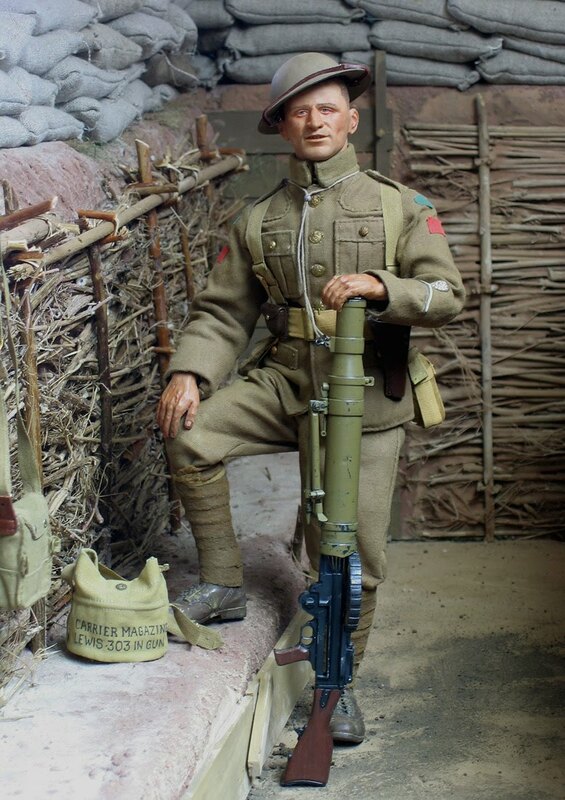 Lewis Gunner, Duke of Wellington's Regiment, 4th Div.1918. The Lewis Gun was the first succesful Light Machine Gun : though "light" was a relative term. It's adoption in 1915 transformed squad tactics : in fact might be said to have invented the modern Infantry squad , normally around ten men , including a Light Machine gun. Oddly enough , the despite being an American-designed weapon , the US forces never adopted it , but the British seized on it with relish, and it was manufactured to use their .303 ammunition. The Germans never managed an equivalent , and went so far as to organise squads using captured ones.. There were drawbacks : it was heavy , suffered from various stoppages , and the pan magazines were awkward and collected dirt easily. Despite all that , it gave the Infantry real portable automatic fire, enabling " Fire & Movement" tactics to really work. Private , South Wales Borderers , 1918 . By 1918 , the British Army had endured four years of war ; had suffered terrible losses ( though not worse than other countries) , and had stayed the course. Although it has long been fashionable to decry the conduct of the War ( and how much better it would have been if it had never started ) the fact remains that it was fought to the best of the ability of those running it ; and by 1918 , and after recovering from Germany's last gasp offensive in March, the British Army started to win it. 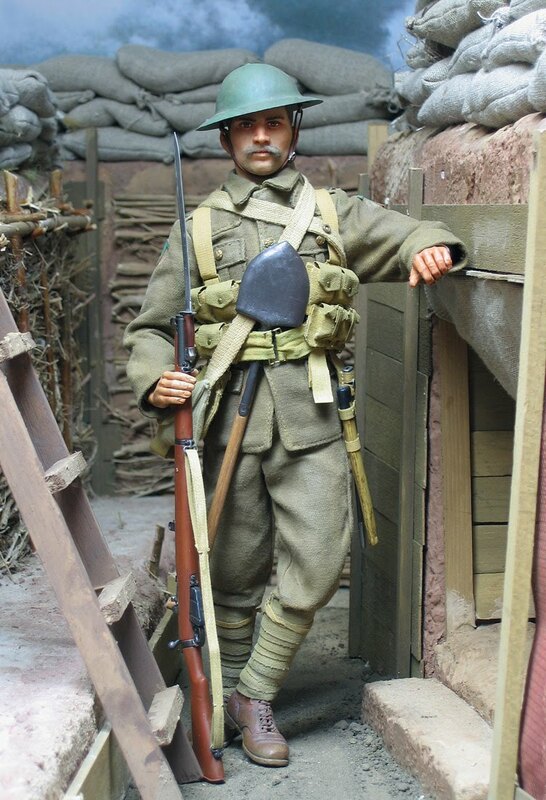 The figure represents the Tommy of this phase of the war : it is testament to the basic soundness of his equipment that it had changed little since 1914 . The shrapnel helmet was now normal, and he wears the warm and practical leather jerkin, and on his chest is the gasmask in its webbing case : still essential . Advancing behind a massive barrage, he carries wire pickets , spare ammunition , shovel and sandbags to consolidate the gains made. In the absence of practical cross-country transport , everything had to be carried by men : sheer hard labour. The last Hundred Days of the War provided the greatest uninterupted victory ever gained by the British Army ... almost unknown today. The basic uniform is from Sideshow, retailored and dyed. Everything else is homemade, heavily rebult, or one of my own castings, apart from the excellent BBI SMLE Mk.III* rifle , which has a wire cutter mounted on the muzzle.